Hey all you 30- and 20-somethings, listen up, ’cause grumpy old Gen X Man has something to say to you: You did not invent the world. I know, I know – exactly the kind of thing you’d expect from a curmudgeon who was born before the internet, the cellphone, Facebook, Netflix, PVRs, blah, blah, blah. But pay attention because this might actually interest you once you’ve had a chance to tear your attention away from your disappearing text messages and your next potential Tinder conquest. Lately, I’ve seen a few examples of so-called new tech that frankly, is anything but new. Let’s take a the crowd-sourced project known as “Vocca” as an example. You’ll like it. It’s a gadget that turns any lightbulb in your home into a — wait for it — voice-sensitive light bulb that will turn on (AND OFF!!!) at the sound of the right voice command shouted in its direction. Is that a collective “ooooh” I hear? Thought so. And with good reason too. It *is* a neat idea. After all, what could be handier than lights that can be switched on and off from the comfort of your bed instead of requiring the old-fashioned process of getting up, walking across the room, flicking a switch and then reversing yourself? But guess what? Someone invented the Vocca decades ago. 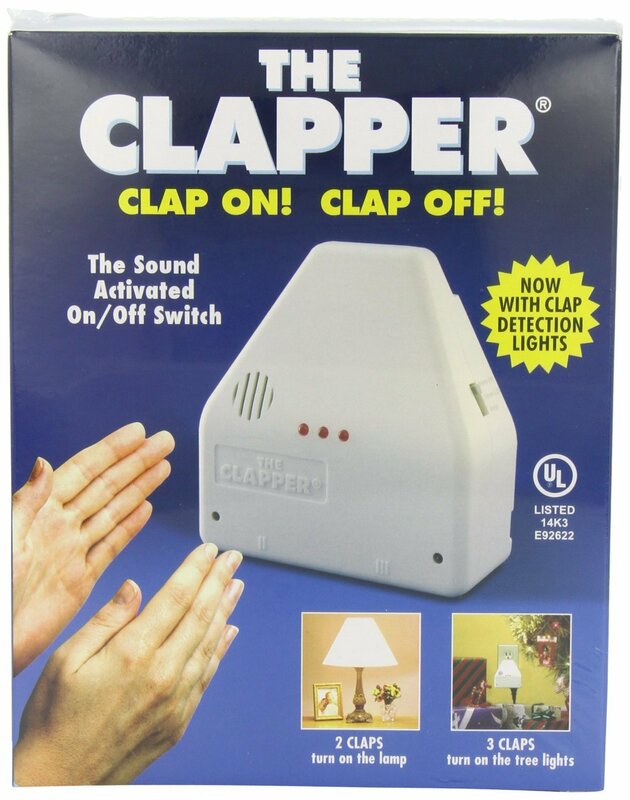 It was called The Clapper, and they’re still on sale today. The Clapper is superior to the Vocca in three important ways. One, it’s cheap. One Clapper costs only $18 at Walmart — compare that to the $39 + for the Vocca. Two, it controls more than just lights; it can control any electrical appliance you can plug into it. Three, it doesn’t require any special phrases. Just clap your hands to turn it on, and then clap again to turn it off. This also means that the Clapper provides support for an unlimited number of languages. Et tu, Vocca? What’s most surprising is that of all the write-ups I’ve read on the Vocca, only one author has pointed out that the gadget is an over-priced, over-designed, and far less versatile Clapper. Not one. Why? I can only guess that most of the people who have written about the Vocca, much like the creators of the Vocca themselves, must be too young to remember the onslaught of “Clap-on, Clap-off, Clap-on, Clap-off” commercials us 40-somethings were exposed to for most of our formative years. And though you didn’t miss a lot (the commercials were really dreadful), you did miss the fact that we already have a Vocca. It’s called the Clapper. Though it’s as useful as it sounds, it sure isn’t cool. And if you think clapping at your lights sounds silly, wait till you have to shout at them. Repeatedly. Every Thanksgiving, our family does what thousands of other families do – gather in large numbers and sit down to a dinner that challenges even the most alert and caffeinated person to stay conscious. We also take a moment and express the gratitude we feel for the people in our lives. It’s a good thing to do. Especially for people living in such an amazing country as Canada, with all of the privileges that we enjoy, taking the time to appreciate them is something we should do daily. One of those privileges is access to some of the most advanced technology in the world. Here then, is a list of the top tech that we’re thankful to have – in no particular order – submitted by your Sync Bloggers: Andrew, Jeremy, Marc, Rhonda and me, Simon. Whether you’re a member of the Apple tribe or a fan of the many worthy iPod alternatives, the ability to take your entire music (or photo or video) collection with you wherever you go, might just be the biggest thing to happen to the tech landscape since the Internet itself. What good is gazillion tunes in your pocket if you can’t listen to them while on the road? Now granted, most FM Transmitters perform poorly in urban areas, and they pale in comparison to built-in auxiliary jacks or iPod-ready car stereos, but for masses of people who own cars that aren’t so equipped, these devices are the only way to go. When we think of companies that have had a profound effect on the way we use the computers, the list is remarkably short. You know the biggies: Microsoft, Apple, Google, AOL, Yahoo!. If Facebook wasn’t on this list earlier, there’s no question it should be there now. Remarkably, despite ongoing issues of privacy, security and in some cases banality, Facebook marches on and has become a central tool in the lives of millions. Pioneered by the Canadians at RIM and then reinvented by Apple and Google, smartphones have become the ultimate digital companions. By combining the best features of cellphones, MP3 players, PDAs, portable game consoles and laptops, smartphones are already replacing the many devices they emulate. As the web continues to churn out more tools to help keep us connected, be it Facebook, Twitter, FourSquare or YouTube, our smartphones play an increasingly important part of our digital lives. Whether you are on cable or satellite, High-Def or Standard Def, the personal video recorder (PVR, DVR, TiVo) has revolutionized the way we watch TV. Gone are the days when we had to be at home in front of our sets to enjoy our favourite shows. Gone are the days when we had to program our VCRs – assuming you could ever get the clock to stop blinking “12:00”. Add to this the ability to skip commercials and being able to record up to two shows while watching a 3rd, and it’s nearly impossible to remember what life was like before the PVR. Email, instant messaging, tweeting – they’re all valuable tools when it comes to online communication. But sometimes there’s just no substituting a genuine phone call, and Skype has transformed the voice-to-voice business by offering free device-to-device calling for millions of people. Layer on top of this the ability to do video calls via webcams and you can “see” why Skype has become indispensible for everyone from business people to those simply wanting to keep in touch with family and friends. Being able to video chat with your kids from 30,000 feet in the air is the kind of thing we could only dream about a few years ago. I still remember my first Wi-Fi experience at home. It was about 6 years ago and I had just installed a Wi-Fi gateway. That evening I sat in bed with my laptop and giggled to myself in the way that only cool tech can make me do. When my wife asked what was so funny, I simply said “I’m surfing the web”. Five minutes later she was hooked. We’ve never looked back. Back then, Wi-Fi was still a novelty. Now it has permeated almost every nook and cranny of our homes, offices and schools. While some argue that this technology may pose health risks, and that we need more studies to determine “safe” levels of exposure, the benefits – for now – far outweigh any drawbacks. Wi-Fi is no longer just a convenience; it’s an essential ingredient of our digital lives. There seems to be two kinds of people: Those who like to take photos and those who don’t. You know who you are. For those that like to take ‘em, digital photography has been nothing short of a revolution, simultaneously increasing creative options while driving down the cost per photo to practically zero. The switch from film to digital has meant no longer needing to ask the question “Should I take that photo?” replaced instead by the more pertinent question “Should I keep that photo?” And even though going digital has meant that we print fewer images, it has also meant that we now share them far more often and with way more people. If the value of a photo can be measured by how many people get to enjoy it, digital photography (combined with the web) has increased the value of our photos immeasurably. Other than the computer itself, and perhaps the telephone, it’s hard to imagine an invention that has had such a profound effect on the lives of so many in such a short period of time. The Internet has evolved from being U.S. Defence research project in the 60’s to become the thread that unites (and sometimes separates) billions of people around the world. What started out as a way to let individual computers talk to one another in the event of a global catastrophe, has since become the birthplace of hundreds of new companies and technologies and the means by which organizations of all sizes can establish and pursue their goals and ambitions. For better or worse, The Internet has changed the world forever. Buggy, resource hog, annoying – these are all words that have been used to describe RealPlayer, a multimedia player that has been around for nearly as long as the web itself. Though the software arguably proved that the Internet could be used for streaming content rather than just downloading it, the team at RealMedia also infuriated users by loading material that was akin to adware and in one case actually violated users’ privacy. What was once the heir to the iTunes throne has since become irrelevant. These are the phone calls that make one wish we could reach through the phone and do very very bad things to the person at the other end. You know the ones – your phone rings (usually with that long-distancy ring that sounds so much more important than a regular ring), you pick up and say “Hello?” and are rewarded with… silence. Sometimes the silence persists for more than 10 seconds while you repeatedly and with an increasing amount of irritation say “HELLO? ?” into the receiver. Ok gang, there you have it. So, which tech are you most thankful for? What did we miss? And since it’s human nature to do so, why don’t you share a few tech pet peeves too. A U.K. neuroscientist says that the use of Twitter, Facebook and video games is forcing children's brains to go back to an "infant-like state". Like it or not, cell phones at work have become a fact of life. But just because your little portable pal is ringing, doesn’t mean you need to answer. A recent poll indicates that office workers have plenty of gripes, and most of them are about the behaviour of their co-workers. The list has plenty of tech complaints, but the biggest annoyance is also one of the oldest.